Download this free application from Smart Comunications to enjoy a free mobile internet access to Facebook, Twitter and Yahoo Services on your Android phone and iOS device. You can also enjoy chatting with your social friends in Facebook and Yahoo using Smartnet App. Yahoo services like Yahoo Mail, Yahoo OMG, Yahoo Search and Yahoo Messenger are also free when you use the app. Download Smartnet App by Smart and continue reading below. 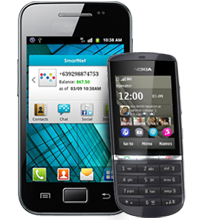 Smartnet App for Nokia or Java capable phone just go to your default web browser and type http://m.smartnet.ph to use the application. Good coz it's free. But it doesn't update FB newsfeed even if I'm subscribed to a data plan. Does it only update through WiFi? I'm confused. :/ please fix this. Otherwise a good, free app. :)"
Nice.. To register turn wifi off 1st then use GPRS.. After registering u can now switch to wifi or GPRS for future connection"
Keeps on saying "Uh oh, something went wrong" blah bla. Its a total crap. Pwe! Uninstall." Okay 1 because its free. Its very glitchy.. Annoying sometimes.. There' lots of bugs. And it eats up large part of the memory. Plus its taking a while.for.the dvelopers to update it when they know theres a lot to improve." You may find more user reviews, feedback and comments of Smartnet App here or you may read FAQs on how to use Smartnet App by Smart. isn't the app available for symbian too?